Preliminary examination, qualitative, as a powderised sample in accordance with guideline VDI 3866, page 5. According to “Data sheet on the disposal of asbestos-containing waste” of NGS Ltd. 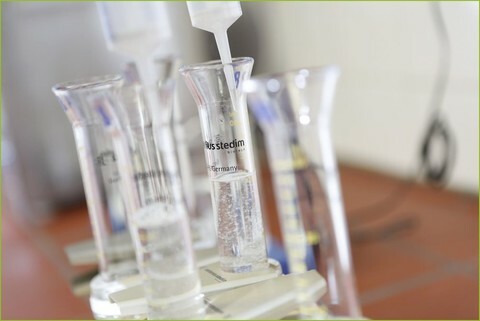 Determination of Polycyclic aromatic hydrocarbon, PAHs according to EPA in collaboration with partner laboratories. 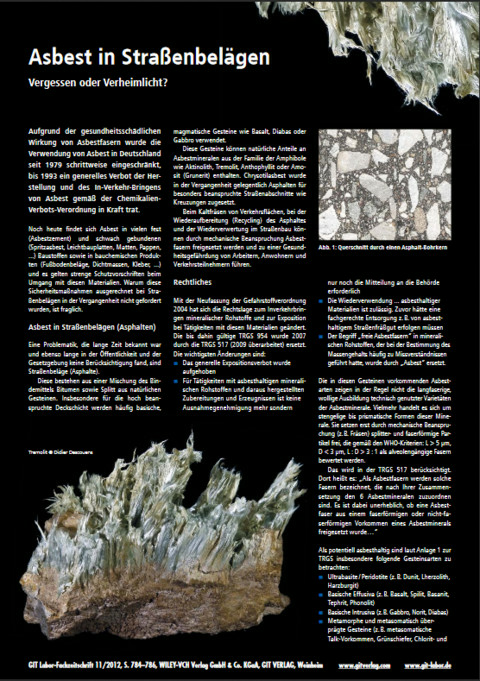 These often have a natural content of asbestos minerals from the amphibole family like actinolite, tremolite, anthophyllite, amosite (grunerite). Asbestos fibres may be released by mechanical stress during pavment cutting, especially cold planing of paved traffic areas and recycling or re-used in road construction. They are a potential health hazard for workers, residents and road users. Technical rule TRGS 517 describes safety measures concerning the working process with naturally asbestos-containing mineral raw materials and any product or mixture derived from them. 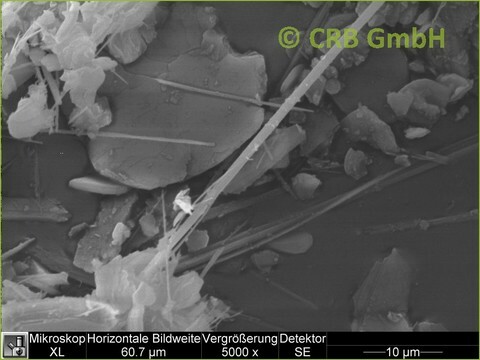 It prescribes that IFA / BIA procedure 7487, BGIA 7487 - measures regarding the analytical determination of low mass contents of asbestos fibres in powders and dusts by SEM/EDX, figure 7487 – is to be used for the determination of the asbestos mass content. Alternatively, according to NGS “Data sheet on the disposal of asbestos-containing waste” testing for asbestos in bitumen or tar –containing road construction waste - can be made according VDI guideline 3866, page 5. Provided that no further fibres can be detected no further testing is necessary. If fibres can be detected according to this procedure quantification according to IFA / BIA procedure 7487 is compulsive.